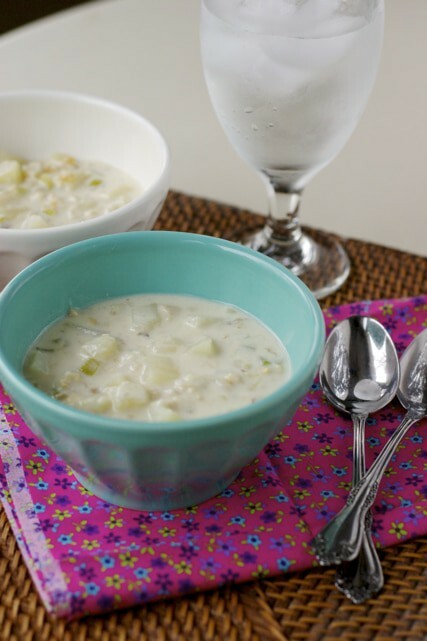 New England clam chowder is one of my favorite soups ever. It’s a simple soup that is hearty enough to make a meal out of when paired with a big salad and maybe some dinner rolls or crusty bread. My kids even love this soup. You can easily make this low fat by substituting the cream with fat free milk, but of course, the flavor would not be anywhere near as rich as when you use cream. I also like to use the best quality clams as possible. I don’t really use too many canned products (just a personal preference based on flavor) but I don’t mind using canned clams here, since I don’t feel the flavor is compromised too much. I also know first-hand that it can be difficult to find fresh clams in many parts of the country (it was very difficult when I lived in the Midwest). To make this soup, I purchased my clams at a fish market, and felt that they did carry a higher quality brand, although I do forget the exact name of them. The soup came together in a snap, was enjoyed by all, and went quickly. Time to make another batch! Cook bacon in medium dutch oven over medium heat until crisp. Remove bacon from pan, reserving 1 teaspoon on bacon grease. Add onion, celery, salt, thyme, and garlic to drippings and cook for 4 minutes or until vegetables are tender. Drain clams (set clams aside), and add clam liquid, clam juice (or fish stock), potatoes and bay leaf to pan. 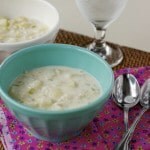 Bring to boil and then reduce heat and simmer for 15 minutes or until potatoes are tender. Combine flour and milk in bowl and whisk until smooth. Add flour-milk mixture to pot, return to boil and then reduce heat and simmer for 12 minutes or until thick. Add clams and continue cooking for 2 minutes.